The 3M understanding that thickness is no substitute for technology was the motivation behind the development and production of the latest generation of 3M security window films. A bomb blast has two phases - a positive phase, where the glass is pushed away from the source charge, and a negative phase, where the glass is pulled back toward the source charge. These two phases subject glass to significant stress. A film with little elasticity provides little cushion during such shock. Consequently, thicker films provide less protection throughout the course of a bomb blast. Thick window films cause optical distortion from both sides of the window in a fashion similar to that of a thick pair of eyeglass lenses. This reduces an occupant's ability to see outside with visual clarity and alters a building's cosmetic appearance. In March 2002, Fortune magazine named 3M as America's most innovative company. The underlying technology of 3M security films illustrates such innovation. Without sacrificing blast protection or building aesthetics, 3M developed a thinner security film comprised of an industry unique and patented system of multi-layered, cross-woven polyester fibers. For every 2 mils of film, there are 14 of these layers. A multi-layered manufacturing technique creates product elasticity to allow the film to "give" with the glass during an explosion. This "give" provides the glass with a cushion during the related stress and shock. That cushion better protects occupants from flying glass shards than would a non-elastic film. The main benefit afforded by cross-weaving the polyester fibers is that tear resistance is maximized. Regardless of how a window breaks, the applied film will always be torn against its grain. Consequently, a 6 mil thick 3M film is more difficult to tear than a competitor's 11 mil thick product. This strong, thin film increases tenant safety without creating optical distortion. Only the 3M Company manufactures multi-layered security films. 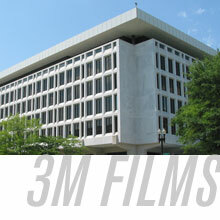 However, for clients (especially government clients) who must adhere to a set specification for film thickness, 3M offers single-layered films in 7, 8, and 14 mil thicknesses.